DSEAR (Dangerous Substances & Explosive Atmospheres Regulations 2002) sets out the legal requirement for Thermal Fluid Systems and Representative Fluid Analysis. Health and safety legislation requires that employers provide a safe working environment. DSEAR (ATEX/CAD in Europe) sets out a mechanism for minimising the risks where flammable materials are handled which could create an explosive atmosphere. Employers have a legal obligation not only to comply with this but to prepare and maintain documentary evidence. DSEAR applies to any workplace where a substance (or mixture of substances) with the potential to create a risk from energy-releasing events, such as fire, is present. DSEAR classes petrol, solvents, LPG and certain types of dust as ‘dangerous substances’. Thermal fluids experience falling flash points over time due to the effects of high temperature. This increases fire risk in the event of loss of containment and therefore, is considered as a dangerous substance under DSEAR regulations. The regulations therefore apply to all closed heat transfer systems using thermal oils and synthetics. Provide measures to eliminate, or reduce as far as is reasonably practicable, the identified fire & explosion risks. 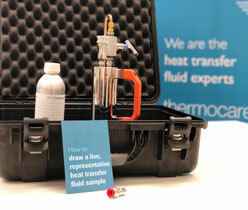 For heat transfer oil this means monitoring of flash points by representative hot, closed sampling and to sustain and/or restore flash points by venting procedures or dilutions where the former is not an option. Apply measures, so far as is reasonably practicable, to control risks and to mitigate the detrimental effects of a fire or explosion and maintain security of the system to prevent leaks and remove sources of ignition. The workplace should be verified as meeting the requirements of DSEAR by a competent person. This would usually be the health and safety manager/director, engineering manager or operations manager/director. 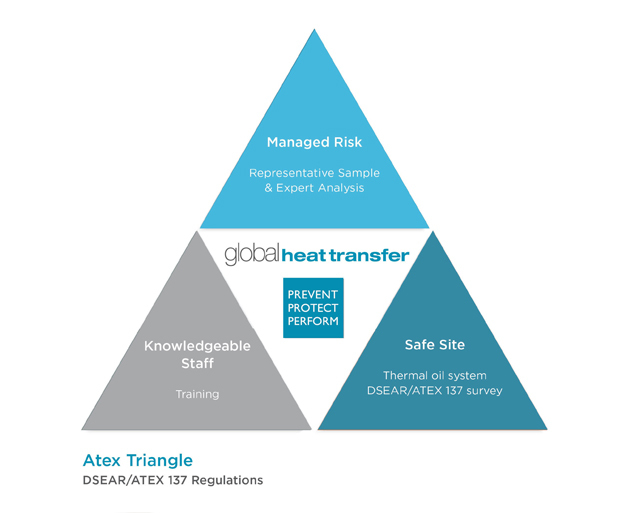 Global Heat Transfer will assist you with all necessary documentation, maintenance schedules and training to keep you compliant with legislative requirements.